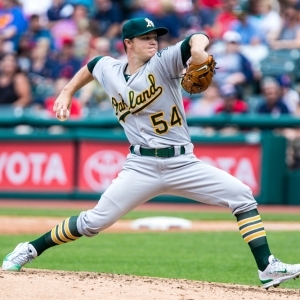 Sonny Gray, Oakland Athletics: Gray has been rumored as a trade target for so long now that it is almost getting laughable. If the A's don't make a deal at some point, though, it would be crazy. He isn't having a great year, but Clayton Kershaw would struggle in front of this total dog of a team. He has had some real bright spots and has been particularly good of late. He is under contract through 2019 at a reasonable price, too, so teams could justify spending more to get him. He'd make almost too much sense in Houston for starters, and the Yankees and others could use and afford him as well. He shouldn't go somewhere where he is expected to be an ace, but in the right situation he could be a massive upgrade for a team. The A's will get a good haul in return, and there is a good chance that both sides will wind up quite happy. And it's not like Gray will ever pitch for a contender if he stays in Oakland. Lorenzo Cain, Kansas City Royals: The list of Royals players who could be on the move is long, but Cain is the most interesting in my eyes. The Royals are still in touch in the AL Central, so they haven't given up yet, but sooner or later they will admit that they can't keep up the charade anymore. It was a good run, but it is time to reload. Cain was a serious MVP contender in 2015, and he is having a pretty solid year this year. He's hitting well, and he plays great center field, so he could be an upgrade in every way for a team - which is the dream of any contender this time of year. He's the kind of guy that could be at the center of a bidding war, and the Royals would benefit. If they play this deadline right then they can jumpstart their rebuild in a hurry. Andrew McCutchen, Pittsburgh Pirates: It wasn't that long ago that McCutchen was one of the top players in baseball. He has declined of late, but he is still only 30, so there is still some wear left in his tires. The Pirates are going nowhere and might as well take whatever they can get for him at this point. He was playing really poorly early in the season and would have been a hard sell. Lately, though, he has found his mojo again and is hitting nicely. Unless McCutchen really isn't interested, the Pirates would be moronic not to make a move here. And I'd love to see McCutchen get one more chance to contend before he's done. Jose Quintana, Chicago White Sox: Quintana isn't putting up quite the numbers he has in the past, but he plays for the White Sox so that's not surprising. He has been really good lately, though, and he's only 28 so there is little reason to worry that he is in decline. He's not a top starter, but he is certainly in the next tier, and there isn't a rotation out there that he wouldn't fit nicely into and improve immediately. It would be a very odd deal, but the best fit might be for him just to travel across town because the Cubs are really being let down by their pitching. What makes Quintana attractive both for the White Sox to trade and other teams to bring him in is that he is under a very favorable contract - the money is reasonable, and he has team options through 2020, so teams can justify paying a premium for him. Johnny Cueto, San Francisco Giants: This one is a no-brainer. Cueto can opt out after this year, and he has indicated he is likely to do so. The Giants are awful, and they aren't going to get any better in a hurry this year. They will lose Cueto for nothing after this year, so they might as well get something for him now. Cueto hasn't been horrible on a lousy team this year, and he is a very highly-tuned playoff contributor. It would be truly shocking if he doesn't have a new temporary address by the deadline. Take advantage and get your $60 worth of member's baseball picks absolutely free - no obligation, no sales people - you don't even have to enter credit card information. Get free baseball picks here now. Get free MLB picks daily at Doc's Sports baseball predictions page .